On this day of remembrance, Americans across the country are gathering in their homes to celebrate the good fortune they have enjoyed over the past year, and hope for more to come in the year ahead. It’a an annual event that generally asks everyone to consider the things for which they are grateful, even if times were hard, as they were for many Americans who suffered through natural disasters, devastating fires, and gruesome mass shootings. This insane nonsense hardly needs any elaboration. Except to note that this statement was made following a photo-op phone call to troops overseas. The purpose of the call was to thank them for their service and wish them a Happy Thanksgiving. But Trump couldn’t avoid being himself. He turned the call into a political diatribe wherein he praised his border policies and insulted the judiciary. So once again, Trump was using the troops as a prop, just like those he sent to the border to confront frightened refugees marching in an “invasion” that exists only in Trump’s cartoon brain (and on Fox News). These are the same troops that Trump refuses to visit in person the way every other president has done. Cadet Bone Spurs is obviously afraid and reports say that he fears he would be killed (fragged?) were he to make the trip. He has also said that he objects to such a gesture because he’s opposed to the troops being over there. It’s fair to assume that the troops aren’t too happy about it either, but they do their duty. So Happy Thanksgiving everybody. 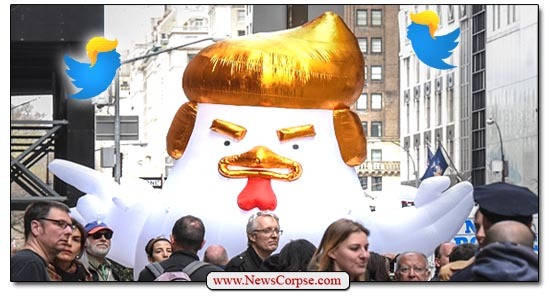 And while you’re having your turkey, try to forget that our president is a chicken. Enjoy this time with your families and friends. And look forward to a future that relieves us all from the harm (and embarrassment) foisted on us by an ignorant, reckless, narcissistic “leader” who longs to be a dictator. When asked what he's thankful for, Trump's answer is essentially….himself. On this day in American History, millions of Americans are celebrating that in only two years we will be Free from the “Family Values Republicans” choice for their President of our United States. What were they all thinking when those “family minded” Republicans claimed Donald Trump was the “be best” of all of them? He’s insulted their own Wives on TV across our United States, and they all stood meekly by as he continued. They have chosen to ignore his whoring around in all 3 marriages Publicly, and now he’s got a Communist born and raised “first lady” dictating on National Security Director’s picks. If those are their Family values, Vote them out when you can, please. And as we celebrate our Thanksgiving, we must ask what do we have to be thankful for. This: Regardless of the lies of the FucksPods and the all-consuming devotion of the Trump worshipers, Their Beloved God and Most Satanic Majesty, Dumbald the First, Russian Puppet, Future Convict No. 24601, is under suspicion by the entire world, his word being questioned by all, constantly proving himself unworthy of the august position he holds and the office he falsely swore to serve and protect. No matter what the FucksPods and Trump worshipers say and do now and from this point on, they cannot erase this fact. And Dumbald the First WILL reach his moment of reckoning. Sooner or later, because WE THE PEOPLE will NOT stand for this forever. WOW, is dump FULL of s*it. I have a deep sense of shame and embarasment that this hideous man is POTUS! As should all Americans.